The Billie Jean King Leadership Initiative (BJKLI) partnered with the United States Tennis Association (USTA) to host the 5th annual BJKLI Symposium at the USTA Billie Jean King National Tennis Center, celebrating the 50th Anniversary of the US Open and 45 years of equal prize money at the US Open. Robert Iger, Chairman and CEO of Disney, and Good Morning America Anchor Robin Roberts received BJKLI’s annual “Inspiring Leader” awards. The 50th Anniversary of the US Open served as the ideal backdrop for the event. Throughout its history, the US Open has championed individuals who have stood for social change, both on and off the tennis court, from Arthur Ashe, to Billie Jean King, to the players holding the torch today. 2018 also marks the 45th anniversary of equal prize money at the US Open, as in 1973, the tournament became the first Grand Slam to give the same amount to the winners of both the men’s and women’s events. The Symposium kicked off with a performance by Chloe Arnold and the Syncopated Ladies who use tap dancing as a medium to convey messages about equity and inclusion. The crowd in attendance was welcomed by Billie Jean King, Founder, BJKLI, and Katrina Adams, Chairman of the Board and President, USTA. “As we celebrate the 50th Anniversary of the US Open, the USTA is proud of the tournament’s history and legacy as a leader in equality for all individuals. We are proud to stand side by side with civil rights pioneer and tennis champion Billie Jean King, after whom we named this very facility, as she continues to push the envelope for change.” Adams said. King commended the efforts of the USTA and all the corporate partners who supported the Symposium. “We are proud to stand with the USTA and all the great companies who support the BJKLI. Together we are refusing to stand on the sidelines and are pushing the ball forward for positive change,” King said. Jan Jones, EVP of Public Affairs and Corporate Responsibility, Caesars Entertainment, and Lucy Lee Helm, Executive Vice President and Chief Partner Officer, Starbucks addressed attendees at the Symposium and talked about the efforts underway for gender equity and inclusion at both Caesars and Starbucks. Both companies have been working with the BJKLI over the past year. Robert Iger, Chairman and CEO, Disney was also recognized by King and Kloss with a BJKLI “Inspiring Leader” award for his bravery, tenacity, and leadership across one of the most influential mediums in entertainment. “When Bob makes a move the world reacts, and he has used his power and platform to rally for greater representation of people of color on screen and stand up against bigotry and hate,” King said when presenting the award. The Symposium ended with Billie Jean King and Christiane Amanpour encouraging people to take “inclusion lanyards” and wear them to the Women’s Semifinals in order to ignite conversations on issues of equity and inclusion. The “inclusion lanyards” have been a feature at BJKLI symposiums in the past and prove to be a powerful medium to advocate for action. 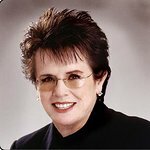 BJKLI was founded in 2014 by equality champion and sports icon Billie Jean King and her partner Ilana Kloss in an effort to move the needle forward on issues impacting equality and inclusion in the workplace. Every year the BJKLI brings together diverse leaders from a range of industries to have honest, constructive dialogue on the state of equality and how to broker tangible positive change. Individuals who have used their power and platform to level the playing field are recognized with “Inspiring Leader” awards. The BJKLI has worked with a number of corporations on leadership and gender equity goals both in pay and representation. Partners of this year’s event included: adidas, Caesars, ESPN, Iberia Bank, Salesforce, Starbucks, Teneo, UBS, USTA. 2018 is a milestone year for both the BJKLI and its founder. The BJKLI is celebrating its fifth anniversary, and King will celebrate her 75th birthday. Members of the Billie Jean King Leadership Initiative Advisory Board include: Billie Jean King, Co-founder; Ilana Kloss, Co-founder; Paul Keary, Co-founder and COO, Teneo Holdings; Pablo Salame, Former Global Co-Head, Securities Division, Goldman Sachs; Christiane Amanpour, Chief International Correspondent, CNN; Jason Collins, Former NBA Player and Civil Rights Advocate; David Furnish, Chairman, Elton John AIDS Foundation and CEO, Rocket Entertainment Group; Maritza Gomez-Montiel, Former Vice Chairman and Deputy CEO of Deloitte; Sir Elton John; Jonathan Kraft, President, The Kraft Group; Robert McCann, Chairman, UBS Group Americas; Pat Mitchell, Founder and CEO, POW! Strategies and Executive Producer of TEDWomen; Robin Roberts, Anchor, ABC’s Good Morning America; Michael Strautmanis, VP of Civic Engagement for the Obama Foundation; Serena Williams Professional Athlete & Entrepreneur, Venus Williams Professional Athlete & CEO/ Founder, EleVen and V Starr Interiors. For more information on the Billie Jean King Leadership Initiative, visit www.bjkli.org.